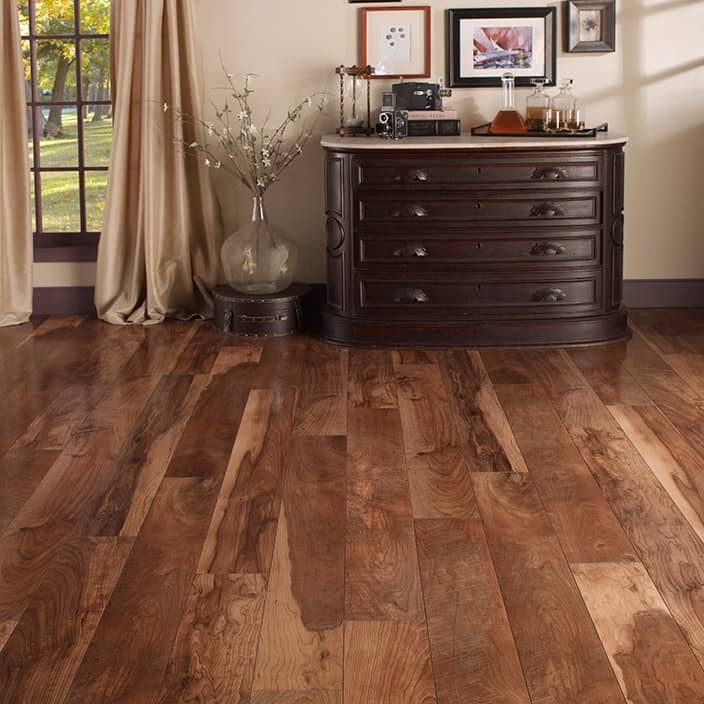 Everyone has some kind of flooring in their home, and everyone wants it to look its absolute best, whether it was just installed or several years old. Some flooring types are easier to keep looking like new than others, but they all need regular care and cleaning in order to stand the test of time (and busy homes). Different types of floors require different cleaning methods to maintain. Carpet needs regular vacuuming, which could vary depending on how much foot traffic there is and if there are children or pets in the house. On average, carpets should be vacuumed really well at least once a week in order to remove the dirt, pollen, and dust that can make your carpets look old as well as cause health problems for your family. Whenever you purchase carpet you should always ask your sales representative for a list of manufacturers approved vacuums. Using the right vacuum when cleaning your carpet is the best way to keep the fibers of the carpet in top shape. When selecting the right vacuum, adjustable height is the most important feature to consider. This enables the machine to be used on a wide variety of carpet constructions. 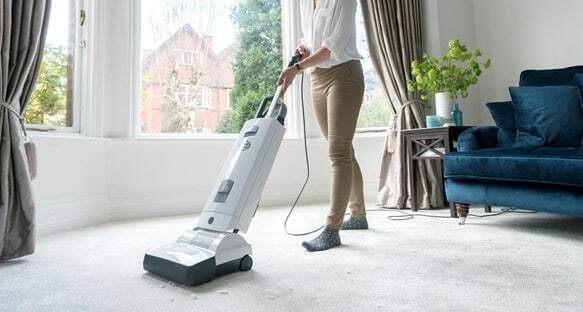 If your vacuum is set too high above the carpet surface, the vacuum can’t attract the gritty soil below. If the setting is too low, the vacuum’s beater bar or brushes can “fuzz” the carpet’s surface, causing it to look worn or frayed. Of course, if you have a very active home, you may need to vacuum several times a week. To keep it from becoming too much of a burden (who really looks forward to dragging their vacuum out, anyway? ), you may want to identify areas of your home that see the most use and do those a bit more often, while leaving your more thorough, full-house vacuuming for the weekend. Clean up any spills right away, and spot treat with carpet cleaner to prevent stains. Check with the manufacturer for safe to use cleaners. Professionally deep clean your carpets every 12 to 18 months to remove embedded dirt and grime. Always check your carpet warranty prior to having your carpets professional cleaned. When using a professional cleaner, please make sure that they are certified and would keep your warranty coverage in tact by using. Professional cleaners are generally reasonably priced and can make a HUGE difference in the look of your carpet. Most manufacturers recommend cleaning your carpet professional at least once a year. Stop dirt at the door by using entrance mats outside and in, taking your shoes off when you enter the house and changing your air filters to reduce airborne dust particles. Hardwood floors are beautiful and incredibly durable, they can last for decades when taken care of properly. Part of that care is regular cleaning, which luckily is pretty straightforward with hardwood floors. High traffic areas need to be swept clean with a broom or dust mop daily. 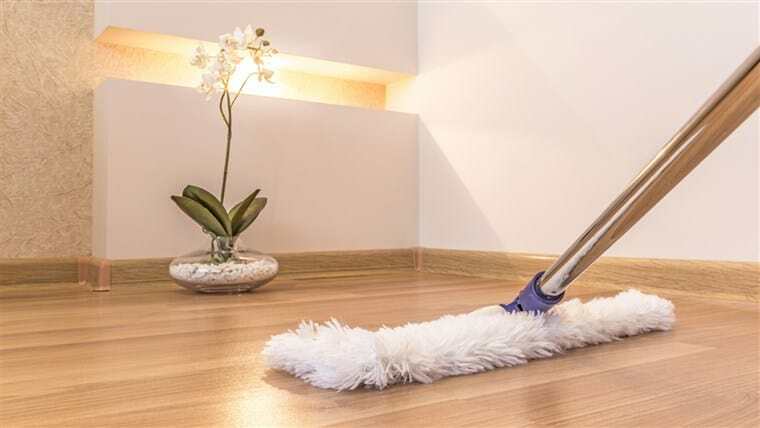 Mops with microfiber heads are work wonders on hardwood floors because they actually pick up all that dust and dirt instead of simply moving it around. You can also use your vacuum on your hardwood floors, just make sure the beater brush is up, or you could damage your floors more than you’re cleaning them. Use a soft cloth to blot spills and spots as soon as they happen. Always avoid allowing liquids to stand on your hardwood floor. Even a small amount of water can damage hardwood floors. The best tip for protecting your hardwood floor is preventing dirt from getting onto it. Place a natural or colorfast mat at outside entrances to reduce the amount of dirt and moisture brought into your home. Use area rugs in front of kitchen sinks and within high traffic areas. Rugs must be made of a breathable material to prevent moisture entrapment. Rugs that have solid rubber or vinyl backings attached to them are not recommended. If you have pets, please remember to keep their nails trimmed to minimize any scratches that can occur. Direct sunlight onto your hardwood floors can also cause damage, so do try to minimize full sun exposure. Tile flooring should be swept or dry mopped a few times a week with a non-abrasive material, such as microfiber cloth. Depending on the amount of use your tile flooring sees, you may need to mop it once a week or even once every few weeks to keep it looking fabulous. For this, just mix hot water and a mild detergent, and a non-abrasive mop or rag. Then, simply buff your floor dry with a soft, absorbent cloth. Also, remember not to forget about the grout! Glazed tile products should be cleaned routinely with an all-purpose, low VOC household or commercial cleaner. Dirty grout can age a tile floor fast, so don’t let all of your scrubbing go to waste because you’ve forgotten this last step. 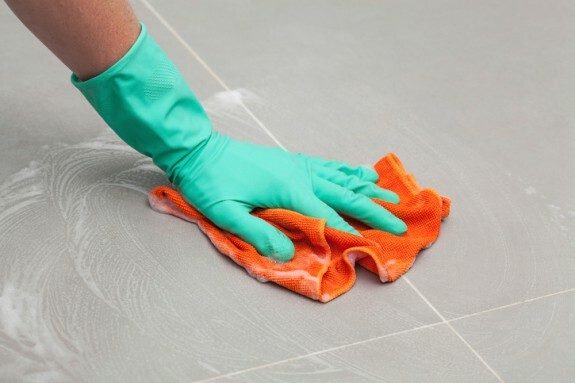 Use a commercial grout cleaner or mild bleach solution to gently clean the areas between tiles. Clorox makes a bleach pen specifically designed for whitening your grout, which is also a great option and saves you the trouble of mixing your own bleach solution. Use a sealer on grout joints shortly after installation and use products compatible with cleaning grout joints. Always remember to test scouring powders and sealants on a small area before cleaning the full area. Prevention is always key in helping to keep your floor looking its best, so don’t forget to place mats at door entries and higher trafficked areas. Laminate and Vinyl floors are relatively easy to keep clean, but they need regular maintenance too. Make sure you clean up any spills that happen right away and sweep or dry mop high traffic areas daily. Less used areas of the house may only need to be swept weekly. You can also use the bare floor setting on your vacuum cleaner to get all of the dirt and dust off of your laminate or vinyl floors. You should damp mop your floors weekly (again depending on use), making sure that your mop is damp, not wet, and that you have vacuumed or swept up all dirt and debris before mopping. When vacuuming your floors do make sure that the beater bar is up as it can cause damage to your floors if left at the lowest setting. Always check with the manufacturer of your flooring to make sure there are no restrictions to the cleaning steps especially if your floors have just been installed. No matter what kind of floors you have in your home, you can keep them looking like new with these simple instructions and some proactive protective steps. Your floors make up a huge percentage of the surface area in your house and are one of the first things noticed when you walk into a room. Give them the care and attention they deserve and the results won’t disappoint! !